RNC will host a call/webcast today at 10:00 a.m. (Eastern Time) to discuss the agreement. North American callers please dial: 1-888-231-8191, international callers please dial: (+1) 647-427-7450. For the webcast of this event click [here] (replay access information below). TORONTO, March 26, 2019 /CNW/ - RNC Minerals (TSX: RNX) ("RNC") is pleased to announce that it has entered into a purchase option agreement (the "Purchase Option") with Westgold Resources Limited ("Westgold") for its Higginsville Gold Operation ("HGO"). The acquisition of the Higginsville operations and its modern, low cost 1.3 Mtpa gold mill would provide a key piece of RNC's strategy to unlock the significant potential of its Beta Hunt gold mine. The Higginsville mill would provide a significantly lower cost milling alternative for Beta Hunt (RNC expects that processing cost savings would be in excess of C$15 per tonne, or a 35% reduction), and add an expected 40-45 koz of gold production in 2019. 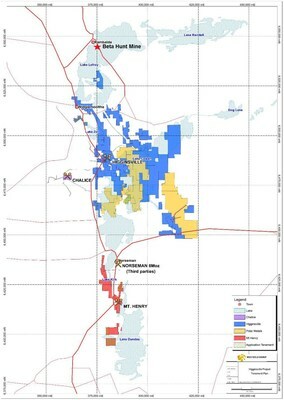 HGO has a 367 thousand ounce reserve within a 1.2 million ounce measured & indicated gold resource, and a further 0.9 million ounce inferred resource, all located on a 386 km2 land position in the Kalgoorlie gold region. RNC successfully tolled Beta Hunt material through the HGO mill in 2018, achieving 94% Au recovery. RNC will make a non-refundable option payment of A$4 million, payable immediately in RNC shares, for an exclusive 40-day period to complete due diligence. Closing would occur 30 days later if the Purchase Option is exercised. On closing, RNC would pay a further A$21 million in RNC shares and A$25 million in cash for total consideration of A$50 million (including the A$4 million deposit satisfied in RNC shares). Mark Selby, President and CEO of RNC, commented "The combination of the Higginsville Mill with the production potential of our Beta Hunt mine provide significant synergies, underpinned by the 35% per tonne cost saving or in excess of US$100/oz versus our current toll milling arrangements. The transaction would transform RNC's gold operation in Western Australia to a multi-mine operation anchored by the 1.3 Mtpa HGO Mill, the exciting high grade and substantial resource potential at Beta Hunt, and a large land position in the Kalgoorlie gold region. The option structure allows RNC to assess a full range of financing options and ultimately choose the most accretive solution for shareholders." Selby continued: "The timing of this transaction is helpful as our drilling program has sufficiently advanced to allow for commencement of a limited restart of bulk mining in areas with mine development already in place. The timing for a full ramp-up decision has remained the same and will be based on completion of the resource update expected by the end of the second quarter. We are pleased to partner with Westgold, a very experienced and well-respected operator in Western Australia, who recognizes the potential of RNC's Beta Hunt mine. " Westgold Managing Director, Peter Cook said, "This is a sensible transaction that gives both RNC and Westgold solutions for their project needs. The addition of the high grade gold discoveries and resource potential at Beta Hunt to the existing operation at Higginsville will provide enhanced gold output at lower costs, as well as security from ownership of substantial plant and infrastructure." The transaction is subject to, among other conditions, execution of a definitive purchase agreement, satisfactory due diligence by RNC, TSX approval and Australian regulatory approval. 1.3 Mtpa gold processing plant, including a gravity gold recovery circuit with Knelson concentrator followed by an Acacia high intensity leach reactor. The plant was built in 2007, along with associated infrastructure including a tailings storage facility. There are several operating and previously operating underground and open pit gold mines on the property. Mining at HGO occurs primarily at the Mt Henry open pit with ore being hauled to the processing plant. Westgold expects to produce 40-45 koz of gold during 2019 at an average AISC of US$1,000-$1,050 (A$1,400-A$1,450) per ounce. Additional revenue will also be generated from an existing toll milling contract. Significant exploration potential, with 200 mining titles comprising over 38,600 hectares in the prolific gold region between Kambalda and Norseman. On October 2, 2018 Westgold published its JORC compliant Annual Update of Mineral Resources & Ore Reserves as of June 30, 2018. For HGO, tables 1 and 2 below summarize the update. RNC will be hosting a conference call and webcast today (March 26, 2019) beginning at 10:00 a.m. (Eastern time). This news release contains "forward-looking information" including without limitation statements relating to the completion of the Purchase Option, production guidance and the potential of the Beta Hunt Mine and Dumont Nickel – Cobalt Project.